Japan’s Orix Corporation, the 23.54 per cent stakeholder in IL&FS, may renew its interest in acquiring majority stake in the debt-ridden infra developer and financier. 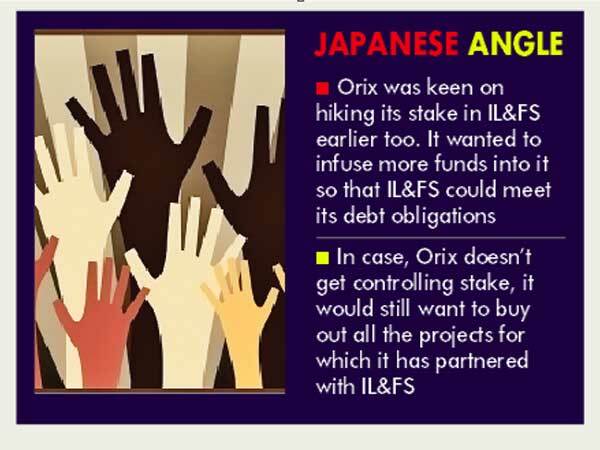 Orix was keen on hiking its stake in IL&FS earlier too. It wanted to infuse more funds into the beleaguered firm so that IL&FS could meet its debt obligations. The board, however, was sacked and the government placed its own nominees on board. The Japanese firm’s interest in IL&FS has only grown after a board led by Uday Kotak has taken over, sources said. It is not, however, clear which route Orix wanted to take to hike its stake. It also depends on how LIC, the biggest stakeholder in IL&FS, responds to the idea. In case, Orix doesn’t get controlling stake, it would still want to buy out all the projects for which it has partnered with IL&FS. In August, the erstwhile board had issued a statement saying IL&FS plans to divest assets, cut debt by up to Rs 30,000 crore and had identified 25 projects that it intended to sell. Official sources said Orix, like LIC, is keen that IL&FS is viable and it is ready to play an important role in the revival process along with the government nominated board. Given the interest of Orix in IL&FS, it is understood that the Japanese company will subscribe in a big way to the upcoming Rs 4,500 crore rights issue of the infra developer and financier. It is expected that Orix will more than make up if Abu Dhabi Investment Fund, HDFC and Central Bank of India don’t participate in the issue. Before the new board took reins of the company, LIC had said IL&FS can raise Rs 70,000 crore by selling assets. LIC is also open to up its stake in the company. IL&FS has a lot of connection with government departments and does a lot of public-private partnership. Among its scores of joint ventures and subsidiaries, IL&FS Financial Services, IL&FS Transportation, IL&FS Energy, IL&FS Environment and IL&FS Education are the prominent ones.